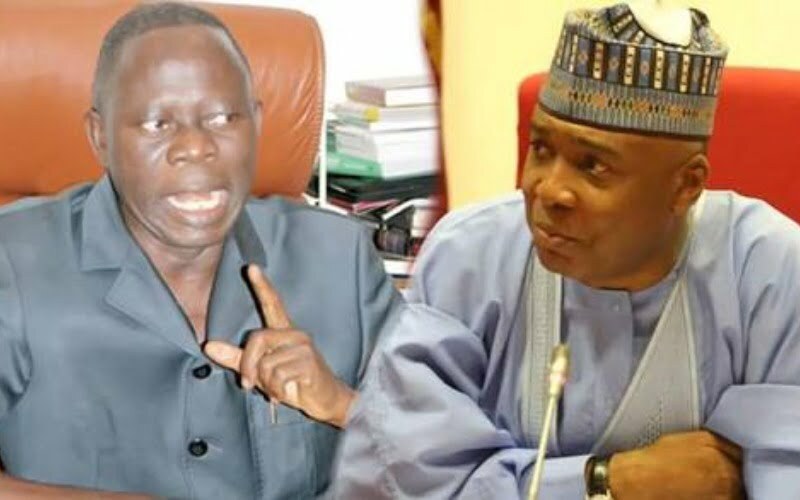 The National Chairman of the All Progressive Congress (APC), Comrade Adams Oshiomhole, has said the Senate President, Bukola Saraki is a disgrace to Nigeriaâ€™s democracy. He said it was pathetic and irresponsible that the Senate president would resort to â€˜petty politicsâ€™. The statement reads: â€œIt is sad that Saraki, who just woke up from slumber occasioned by his crushing defeat at the Port Harcourt presidential primary election of his party, could degenerate to such a low level. â€œIt is equally sad, but not unexpected, that Saraki, who is politically drowning, would make such libelous comments against the national chairman of the APC. And I challenge Saraki to mention one name of an aspirant that gave money to the National Chairman or we file a legal action against him. â€œWhereas, the basis on which he made those comments was tenuous and unjustifiable, it is on record that Saraki has been in the eye of investigations by the EFCC and the ICPC for sundry cases of corruption. â€œThat is the same man that has taken it upon himself to question Comrade Oshiomholeâ€™s credibility. â€œWe challenge him to mention one person who has claimed that he gave money to Oshiomhole to influence him and the decision of the partyâ€™s national working committee (NWC) in the just-concluded primary elections.